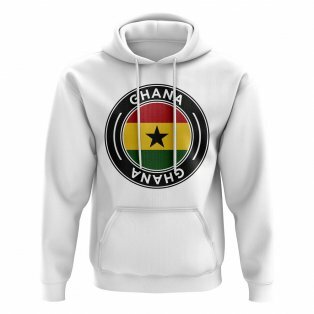 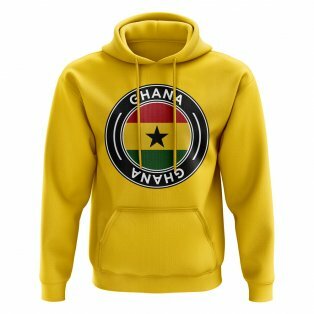 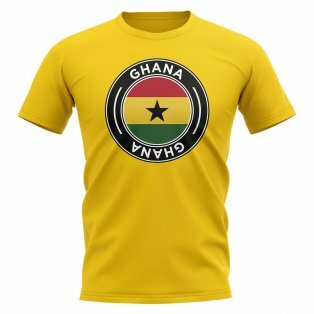 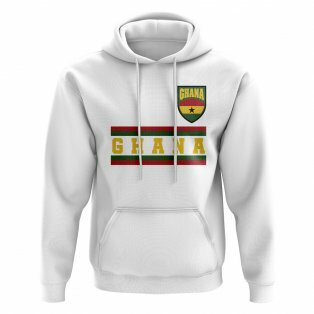 Buy the official Ghana Football Kit at UKSoccershop and get fast worldwide shipping and next day UK delivery. 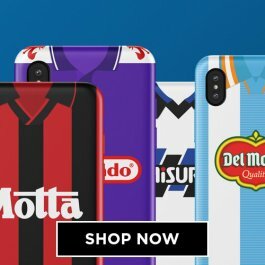 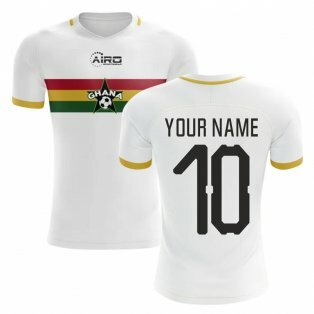 Order the latest Ghana home & away replica shirts and customise your kit with official printing for your favourite player or even your own name and number. 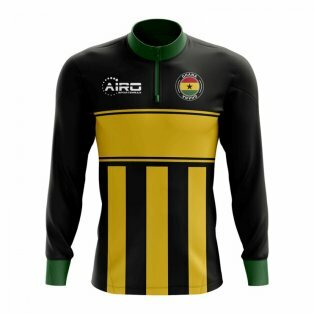 We also sell a range of training clothes, t-shirts and hoodies. 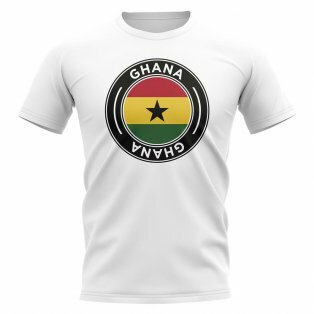 Ghana are one of the strongest countries in the African Federation and along with Ivory Coast, have been our bestselling African football shirt since we began trading in 2004. 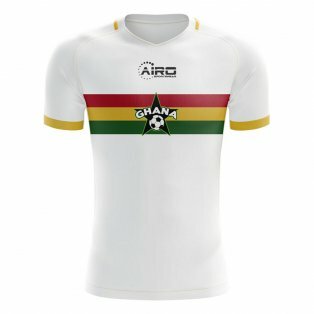 The national team play in a predominantly white soccer jersey which is completed with white shorts and socks and black trim and detailing. Ghana reached their first World Cup Finals in 2006 at a time when they had the strongest squad in the history with Michael Essien, Asamoah Gyan and Sulley Muntari among the star names who were plying their trade in European football at the time. 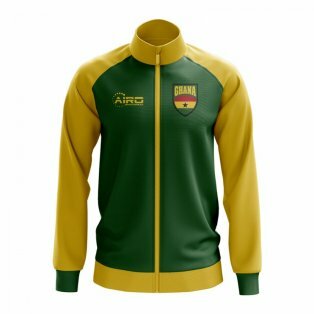 They would subsequently qualify for the 2010 and 2014 Finals and achieved their best placed finish in 2010 when only a Luis Suarez handball and a penalty shootout defeat to Uruguay saw them eliminated in the Quarter Finals. 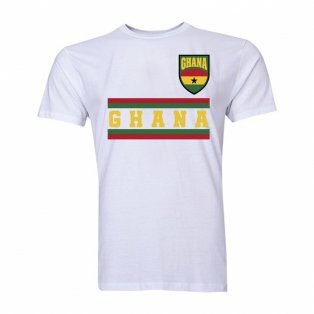 Ghana have also won four African Cup of Nations in their history. 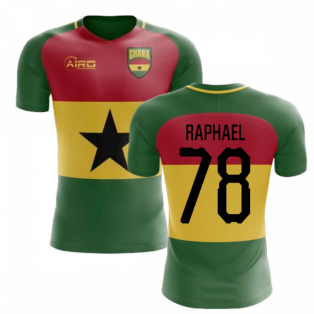 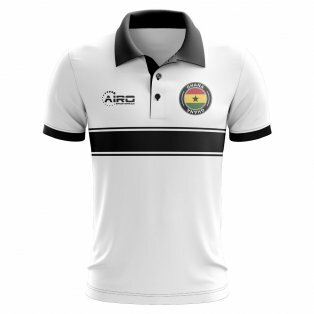 Sales of Ghanaian football shirts have continued to grow with the success of the national team and the increased presence of their players in European football. The countries record goalscorer is Abedi Pele and even though he is long since retired, we still get requests for his soccer jersey, which we are able to supply. 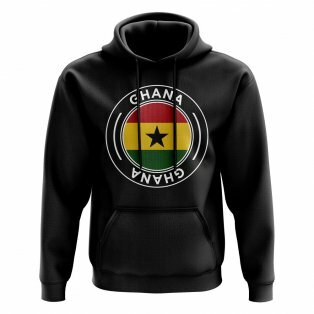 Ghana are nicknamed the Black Stars which is in reference to the star which is featured on both the national coat of arms and the national flag. 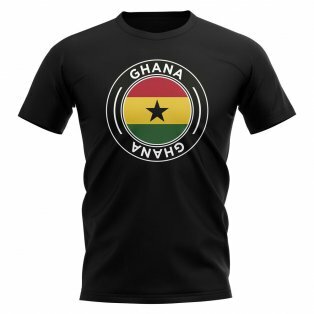 A key feature of Ghana’s identity, as it was adopted following their independence in 1957, it is not surprising that this features prominently on their kits. The national team have had a long standing relationship with Puma, who have manufactured their jerseys throughout the most successful period in their history. 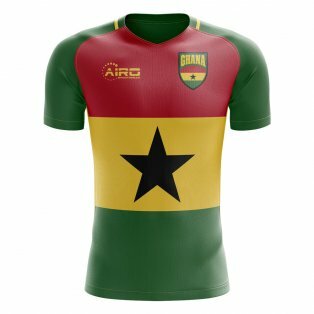 Puma have played a key role in designing kits which keep the tradition and heritage of the nation of Ghana. 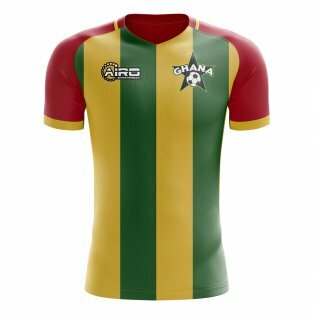 However, the home shirt has not always been white. Previously, they wore a red, yellow and green kit which replicated the colours of the national flag. 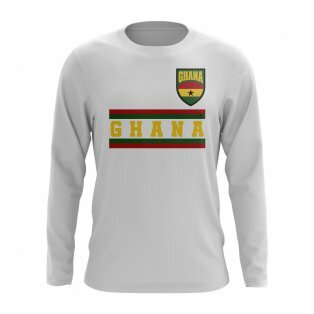 This was adopted in 1989, through until 2006, when Puma returned to the original white kit. 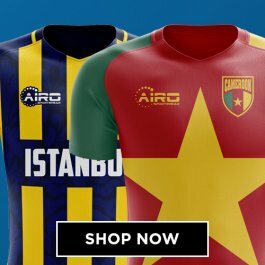 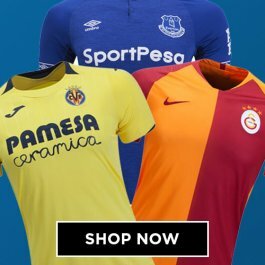 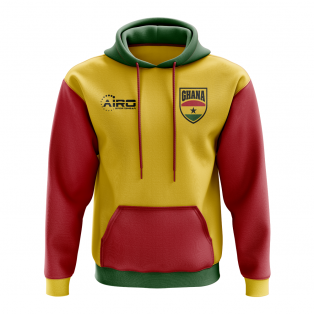 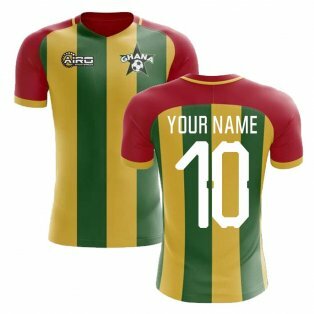 However, there is still a strong demand for the flag colours and the red, green and yellow retro shirt we do remains one of our bestselling retro football shirts. 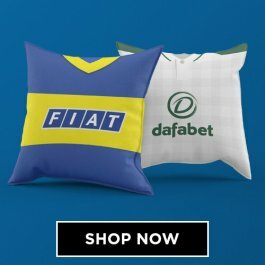 In keeping with tradition, the colours of the national flag are generally adopted for the away shirt, with red being a particularly popular colour for sales. At UKSoccershop, we offer a range of football shirt printing services. You can choose to have any Black Stars player, past or present, printed on your jersey or even your own name and number. 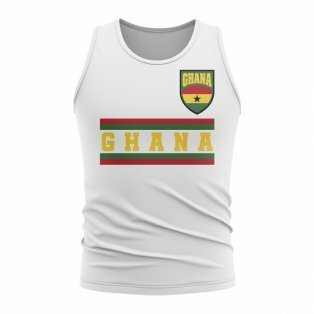 Furthermore, as the popularity of the nation increases, there have been a wider choice of items available for sale. 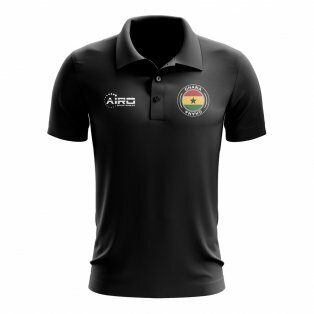 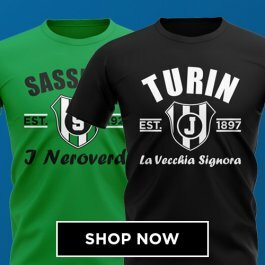 Training shirts, t-shirts and hoodies are just a few examples of items available for sale within our online store.